Bank stocks in general are rather cheap at the moment due to a flat yield curve and growth concerns. Although an economic slowdown or recession would be rough for many banks, some of the fears about them appear to be overblown. I’m not overweight financials, but I’m not avoiding them either. Bank stocks appear appropriately priced at the current time. This article shows several reasons why banks are actually in pretty good shape relative to their valuations. The Financial Select Sector SPDR ETF (XLF) representing the U.S. large cap financial sector currently has an average P/E of about 11.6 and an average P/B of less than 1.4. Due to some big laggards in the mix, it still hasn’t reached the peak value it had prior to the subprime mortgage crisis, although many of the higher-quality banks and insurers have grown tremendously. Warren Buffett’s Berkshire Hathaway has over $80 billion invested in banks. They represent about 40% of Berkshire’s public stock portfolio. Berkshire itself also operates a massive insurance business. Some of his bank stocks are large legacy positions, but in the most recent quarter he started new positions in JPMorgan Chase (JPM), PNC (PNC), and Travelers Companies (TRV), and added to his existing positions in Goldman Sachs (GS), Bank of New York Mellon (BK), U.S. Bancorp (USB), and Bank of America (BAC). He did, however, trim his exposure to Wells Fargo (WFC) which is understandable given their headlines over the past few years. Each summer, I enjoy looking through the annual Dodd Frank Stress Test to see how various banks shape up. Banks get put through an annual simulation that involves asset valuations and employment rates crashing as hard as they did during the subprime mortgage crisis of 2008/2009, and checks to see if the banks have enough capital to withstand the projected loan losses from such a financial crisis. The goal is for them to have more stability to withstand such a scenario without bailouts. However, the tail risk that is not accounted for in the stress tests is stagflation. The simulation assumes low inflation during recessions as an axiom. If inflation were to pick up while economic growth remains low like it did in the late 70’s, that could be a death strike for certain banks and is not accounted for in the test. Right now, most developed countries are in a deflationary cycle, so it would probably take a crisis of confidence in the currency itself to cause a spike in inflation. 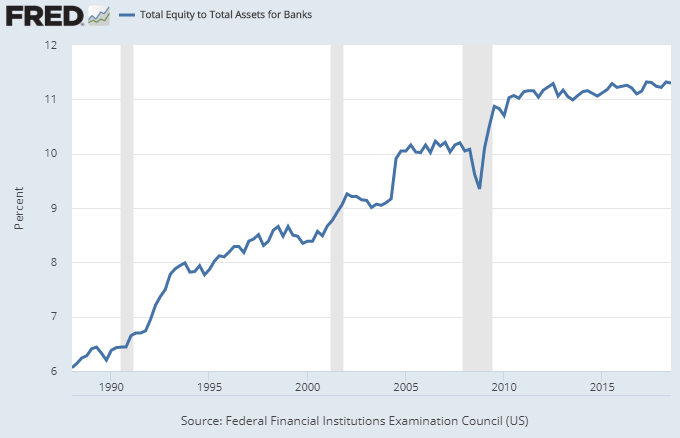 A way to reduce your exposure to the stagflation tail risk while still investing in banks is to focus on diversified banks that earn a variety of fee-based income streams, or banks that have adjustable-rate assets. In other words, I’m not too interested in banks that lock most of their assets away at fixed long-term rates, and am more interested in banks that operate credit cards, wealth/asset management, investment banking, merchant services, payment networks, and so forth. These types of banks also tend to hold up well in the face of a flat yield curve. When analyzing banks, it’s helpful to pay attention to what’s going on with consumers and particularly the housing market. Household debt as a percentage of GDP in the United States has trended up over the past 50 years, but remains well below the peak it reached before and during the subprime mortgage crisis a decade ago. 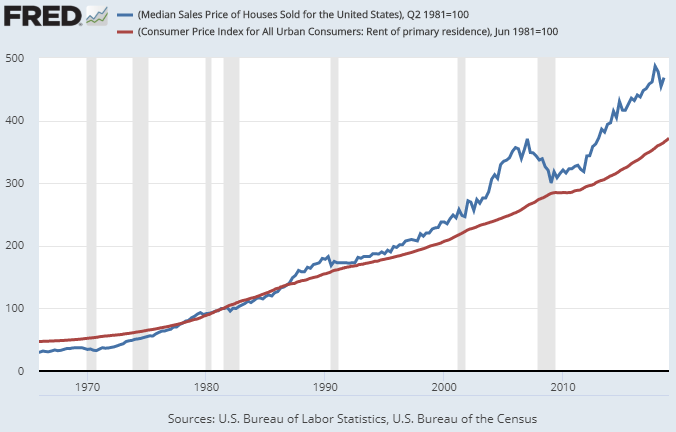 We can see on that chart that house prices are a bit frothy today and may come back down 10-20% during the next recession if any sort of historical mean reversion between real estate prices and rent were to occur. Most banks are prepared for this according to stress test results. 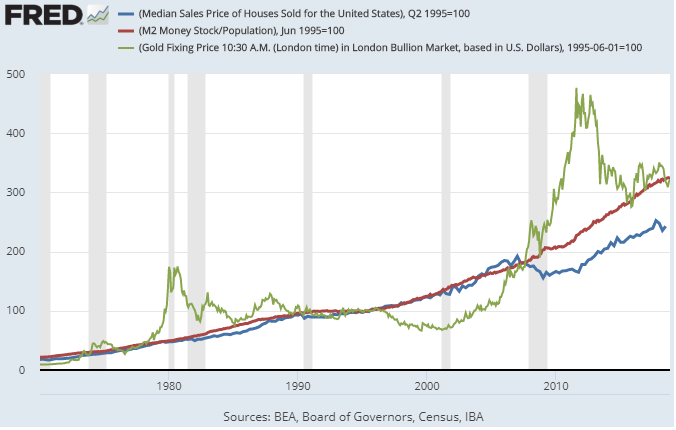 When compared to how much broad money has been created per capita in recent years, residential real estate is actually cheap compared to some other asset classes, including gold. Many types of real estate in key cities are historically expensive, but the prices of normal median home residences in suburbs and other middle class neighborhoods don’t appear to be unreasonable for a late-cycle environment. I am concerned about how many people live paycheck to paycheck, and about the bottom 50% of the population that has basically no wealth. For that reason, I tend to steer clear of some of the more aggressive lenders like Capital One (COF) that just don’t quite fit my investing personality. As I said above, I prefer banks that have adjustable-rate assets, or that have diversified fee income. I also like a focus on quality and long-term management, and business models that are nimble and resistant against new fintech competitors. These two bank stocks are the ones I like at the moment. People might not think of credit card providers as safe, but it’s all about the details. Discover’s loan book is volatile during recessions, but as a consequence they maintain high credit standards and ample reserves ready for such an adverse scenario. Discover consistently passes the Dodd Frank Stress Test year after year, remained profitable during the 2008 financial crisis, and recovered quickly thereafter. Discover is the most volatile pick in my Top 7 Stocks To Buy list, but I keep it there for good reason. The company has been exceptionally well-managed since it went public, and has ranked highest in JD Power’s credit card customer satisfaction for 4 out of the past 5 years. Discover reported $7.81 in earnings for 2018, so the P/E ratio is firmly in the single digits right now. Analysts on average expect EPS of $8.62 for 2019 and $9.44 for 2020, assuming no recession. If we do get a recession and loan losses pick up, Discover will take a big hit on earnings but that already appears priced in at this valuation. The company is very lean because it doesn’t have a physical footprint to maintain. Its bank business operates online, their lending is focused on a few key areas that they have expertise in, and they operate a growing payment processing system. This in my opinion makes Discover resistant to fintech competition, and lets them give highly competitive rates for online savings accounts. Overall, Discover is priced for a big economic downturn. Whenever it comes, Discover stock will probably go down quite a bit, but it is already well-priced for most scenarios and may recover quite quickly. On the other hand, if a dovish Fed helps the economic cycle limp along longer than expected without a major contraction, Discover is undervalued for that scenario, and their large share buybacks are extremely lucrative when the stock is undervalued. JPMorgan Chase is arguably the most diversified bank stock you can buy. They have investment banking, wealth management, retail banking, brokerage services, and a leading credit card business. Investors do pay a bit of a premium for this one, but at this stage of the cycle that’s warranted in my opinion. When it comes to banks, which are inherently leveraged, I’d rather have a great company at a reasonable price than a reasonable company at a bargain price. And banks in general are more reasonably-priced than the broad S&P 500 (SPY) anyway. JPMorgan Chase has a P/E of a little over 10 and a P/B of a little under 1.5. JPMorgan is one of the financial picks in my high-dividend model portfolio. I don’t expect it to have volatility quite as high as Discover, and it pays a yield of over 3%. Overall, while I personally wouldn’t aggressively buy banks like Warren Buffett does due to their inherently leveraged nature, I think many of them are attractively-priced and the appeal makes sense. Buffett is doing what he always has done: buying stocks he thinks are mispriced relative to their long-term fundamentals. In my opinion, Discover’s recent divergence between earnings and share price is a good entry point, but only for investors that can hold through stormy waters and are willing to double-down during periods of fear if it comes to that. JPMorgan Chase on the other hand is way larger and more diversified, focuses on high-end banking activities (where the real wealth is), and is historically well-managed. I expect them to survive the down-cycle whenever it occurs, and come out the other side ready to keep growing. I’ve been noticing a recent trend that sectors that fell the hardest during the previous cycle (especially financials and emerging markets) seem to be preparing for another big crash with low valuations while the rest of the market carries on with high valuations. While those areas are indeed vulnerable and volatile, their valuations are a lot better this time probably because there are more recent memories about them and there are more critical eyes on them. But, as mentioned earlier, bubbles rarely pop from the same place twice in a row. Right now, I’m concerned about popular companies with high valuations and high debt that don’t make a true cash profit like Tesla (TSLA) and Netflix (NFLX), historically defensive companies that have unusually high levels of leverage due to the prevalence of low interest rates, and certain foreign developed markets with housing bubbles. I am not particularly concerned with historically cyclical areas like U.S. banks, semiconductors, and emerging markets that have already priced in significant downside risks. In that sense, my portfolio currently has a quality/value tilt and a bit of a barbell approach with a willingness to hold higher-volatility sectors along with a cash/gold defensive base for re-balancing. Disclosure: I am/we are long DFS, JPM, TRV. I wrote this article myself, and it expresses my own opinions. I am not receiving compensation for it (other than from Seeking Alpha). I have no business relationship with any company whose stock is mentioned in this article.